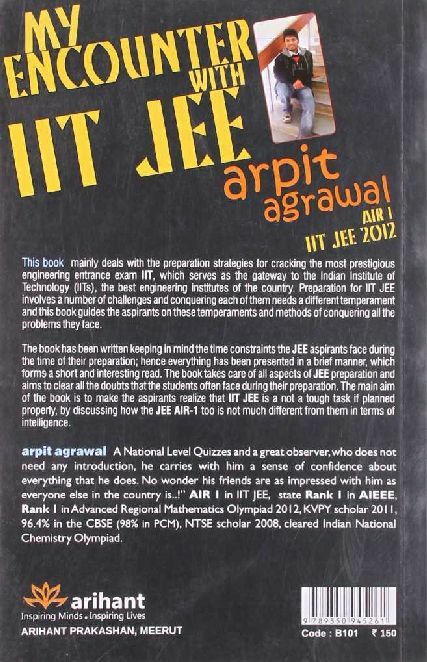 All the yearning IITians are in for a regard as we convey to you the most enamoring and stunning book ever my experience with IIT JEE by the Arpit Agarwal. This book is an arresting adventure of a quick kid who had the intuition to duel the troublesome placement test of IIT and clearing it without a hitch and immediately encountering a strenuous voyage as an IITian. What could be the most ideal approach to acquaint this perfect work of art with the nation, other than to hold hands with the main distributer and the most prestigious name in the field of the IIT JEE Arihant Publications . Arihant recognizes the requirement for this book to achieve the majority so it can direct the maturing hopefuls with precise well ordered tips and strategies running from the misguided judgments about IIT to the new examples, time administration, modification plans, parental direction, passionate balance and numerous other important subtle elements. Arpit has taken out the undisclosed privileged insights of progress from his pack and Arihant is pleased to acquire those insider facts to you the type of a book which will undoubtedly go about as a book of scriptures for each individual trying to wind up plainly an IITian, one day. About the Author, the man needs no presentations yet at the same time for the clueless and un-refreshed few, Arpit is a national level tests master and an incredible spectator. He is certain about his way to deal with everything. Everybody is inspired by his glorious thoughts and learning be it his companions or the entire area. His different accomplishments are : AIR-1 in IIT JEE State rank 1 in AIEEE Rank 1 ahead of time territorial arithmetic, Olympiad 2012 Kvpy researcher in 2011 96.4% in the CBSE exams(98% in PCM), NTSE researcher 2008. He likewise cleared national science Olympiad My Encounter with The IIT JEE will add another plume to his top. 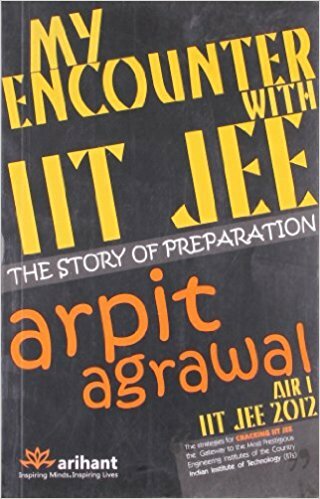 Hi I would like to have the information and details of the book namely â€œMy Encounter with IIT JEE: The story of preparation Paperback â€“ 2013 by Arpit Agrawalâ€�?